Located in Northville, at Beck and 8 Mile Road, Maybury State Park is a great place to spend an active afternoon. The park has about 15 miles of hiking trails, nine miles of paved and mountain biking trails, 11 miles of equestrian horse riding, fishing, and sports fields for baseball and soccer/lacrosse. Many of the hiking trails are laid with a wood chip foundation and are through dense, shady woods, so they are perfect for a hot summer day to enjoy the weather without being overwhelmed by the sun. 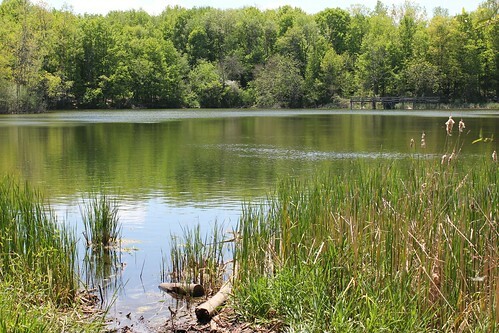 If you need a break while hiking along anyone of these serene trails, there is a very aesthetically pleasing pond located in the heart of the park where visitors are welcome to fish. The park also has a small bridge over the water which is a popular location for fishers to drop in a line. The nine miles of biking the park provides are designed for any type of rider. Whether you are looking for a challenging rugged mountain trail, or just a leisurely ride through the park, Maybury offers both types of paths. If you are looking for a place to unwind after your active afternoon, or if you are looking to just relax on your visit, the park has a picnic area, a couple sheltered picnic areas which can be reserved for private get-togethers, and the park also offers the Maybury Farm, horse stables, and playgrounds which are all strongly recommended if coming with your little ones. Farm hours and horse rentals are available Tuesday to Sunday 12pm-4pm, unless a private session has been arranged. Riders must be at least 8 years of age and weigh less than 240 pounds; long pants and enclosed shoes are required to ride. In order to visit the park, or any state park in Michigan, you must obtain a pass which can be purchased at the park’s main entrance off of Beck Road. Passes cost $11.00 and are good until your license plate renewal, which at that point your park pass is renewed. Park office hours are typically 9am-5pm closing from noon to 1pm for lunch. If no one is there to assist you with buying a park pass, there are self applications in which a pass and car sticker will be sent to you; visitors can still visit the park with a self application submitted. So with just about 1,000 acres of outdoor activities, Maybury State Park is a great place to spend a day this summer, and absolutely qualifies as one of MI Big Green Gyms.